Wow, what fantastic weather we’ve been having and what wonderful, memory-making holidays our families have been enjoying over the past month. As always, this is thanks to the extraordinary network that is THHN. Thank you to everyone who helps, in any way whatsoever. Please don’t forget that we’re always on the look-out for new people and businesses to join our amazing network so if you know anyone who might be interested please get in touch. In the meantime, here is this month’s round up of activities. Do check out all the events going on – hopefully see you at one (or more) of them. Who enjoys a spot of golf? Who’s a bit rubbish at golf but likes a go on a pitch and putt anyway? Who likes a BBQ? Well, how about a Sunday evening over at Cayman Golf in Churston? 18 holes of pitch and putt followed by a burger or hot dog – all in great company and all to raise money for THHN. It’s a no-brainer really. The fun starts at 6.30pm on Sunday 12 July and tickets are available to buy in advance from the Memory Maker Shop in St Marychurch Precinct for just £7.50 or e-mail carolanne@thhn.co.uk. We’ll see you there. Tickets for our 2015 Grand Raffle are now on sale. A big thank you to Babbacombe Garage, The Cavendish Hotel in London, First Great Western, Shearings Hotel group and all the other businesses that have donated prizes. It’s been another busy month for our super caravan as it was holiday home to families referred by the Childhood Eye Cancer Trust, The Shakespeare Hospice in Stratford on Avon and Rainbow Hospice for Children and Young People. Thank you so much, guys, for setting off on such an incredible challenge to raise money for THHN. 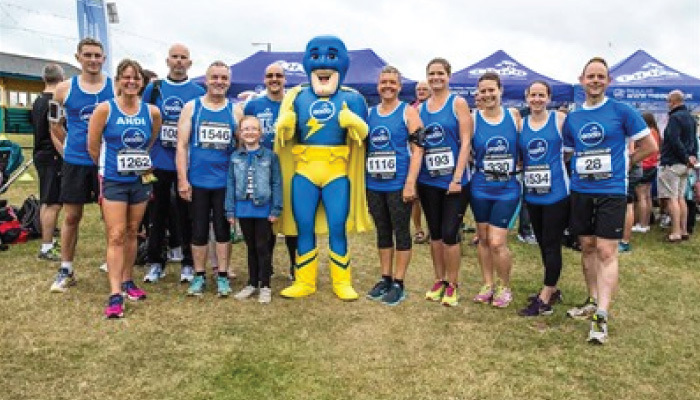 Well, Paignton Green saw a sea of blue in more ways than one at Torbay Half Marathon on Sunday 28 June. We think it’s safe to say that we not only raised lots of money but we also raised a lot of awareness too. Incredibly, over 500 people took part in our first ever THHN Memory Maker Fun Run and THHN Schools Challenge, as part of this great event. Tremendous THHN thanks goes to everyone who took part in the Half Marathon, the Fun Run, the Schools Challenge, the first ever THHN Mascots Race (won by Gilbert the Gull, who just pipped Memory Maker Man at the post), everyone who volunteered and helped out, to Angels Tea Rooms for their generous sponsorship and to Matthew Bunce of Purplepixel Media for the cracking pictures. It really was a wonderful day of fantastic support and fundraising and the money is still rolling in. The living legend and all round THHN warrior and hero that is Glen the machine Bevan has completed a mind boggling Ultra-Ironman challenge in aid of THHN. Day 5: ran 26.7 miles in 4hrs 30mins burning 4571 calories. Current total raised is £4600! We truly cannot thank Glen enough and all of his amazing family and support crew for helping achieve this amazing feat! Don’t forget, the big event…. E-mail cts53@thhn.co.uk with any queries whatsoever. Hotel De La Mer in Babbacombe who welcomed a family referred by the Bristol CLIC Sargent team as well as a family referred by Victim Support. D&H Fisheries, Halletts the Bakers, Riverford Home Delivery, Claire’s Cakes, Save on Meats Torquay, Vain Train,Teddy Mountain UK, and West Country Fruit Sales for all the goodies they provide for our holidaying families. The wonderful Jasmine, who raised a superb £65.20 for THHN by cleaning lots and lots of cards as part of her civic award. Memory Maker Man and Brian went to meet her to collect the money she had raised. Angie, John, Carolanne and Neil, who ran our fabulous fundraising stall at the Rotary Club of Preston’s Family Fun Day raising £165.80. Thanks also to the Rotary Club for letting us be part of such a great day. Vomero Holiday Apartments who gave a holiday to a family from Victim Support. Fancy’s Cottage in Dartmouth who welcomed a family referred by The Lifetime Service. Pat Hayward and all at the Abbey School and Nursery who presented Memory Maker Man with a cheque for a staggering £1268.80. The money had been raised by a sponsored toddle and walk around the school grounds – how lovely. St Christopher’s Holiday Home in Torquay who have welcomed a family referred by the Childhood Eye Cancer Trust. Our Memory Makers shop in St Marychurch Precinct has its very own Facebook page. It’s the ideal way to keep up to date with all the great bargains that come up for sale. Please give it a “Like” to make sure you don’t miss out!